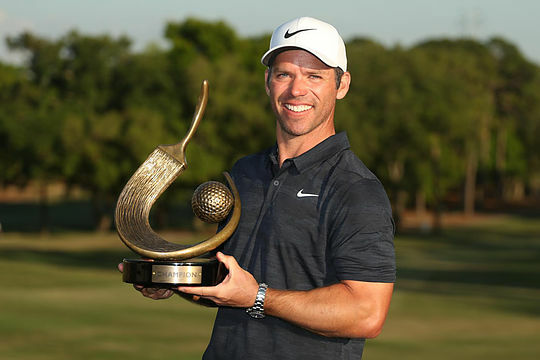 It took Paul Casey nine years to capture his second PGA Tour title and now he has won a third trophy just 12 months on. The Englishman became the first player to successfully defend the Valspar Championship at the Innisbrook Resort and takes home $1.2 million for a total of $3 million this season alone. The 41-year-old went head-to-head with World No. 1 Dustin Johnson over the final round posting a final day 1-over 72 to win by a stroke with an eight-under par tally. Johnson was never a threat, uncharacteristically failing to post a birdie in a 3-over 74 to end the tournament in a share of sixth place at 5-under. It was fellow American Jason Kokak (71) along with former Open Champion Louis Oosthuizen (69), who shared second place at 7-under. Twelve months ago, Casey had denied overwhelming crowd favourite Tiger Woods to capture his second PGA Tour title. Now a year later and Casey has captured a third Tour win to become the first repeat champion in the 20-year history of the event as well as celebrating a 20th worldwide success. Casey’s win will go some way towards making amends for his loss to Phil Mickelson last month at the rain-affected AT&T Pebble Beach Pro-Am. “It feels bloody good,” said Casey smiling broadly. While Casey is now heading to Texas for this week’s WGC – Dell Technologies Match-Play, his focus is clearly on the Masters in just a few weeks’ time. “This win is mega for me heading to Augusta,” he said. Matt Jones and Curtis Luck were the only Australians to make the cut with both players finishing in tie for 13th at 3-under. John Senden, Jason Day, Rod Pampling and Cameron Davis all had the weekend off.